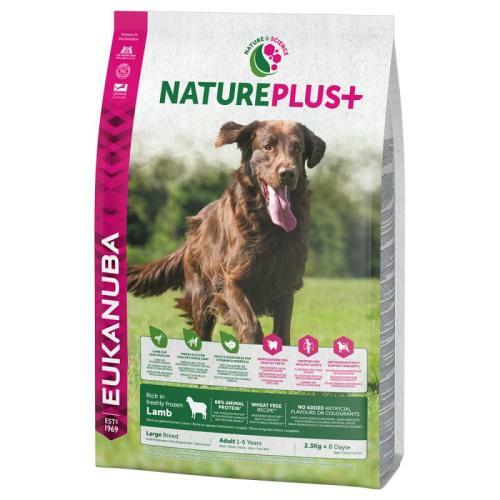 Eukanuba Nature Plus Lamb Adult Large Breed Dog Food is a brilliant mixture of nature and science. With a wheat-free recipe based on more than 45 years experience in the production of high quality pet nutrition. It contains a rich variety of natural ingredients that offer an invigorating meal for adult large breed dogs. A high content of freshly frozen New Zealand lamb provides valuable animal protein that helps build strong, lean muscles. It is also supplemented with a unique combination of fruits and vegetables that are rich in vitamins, minerals and fibre. Freshly frozen lamb (15%), dried chicken and turkey, rice (15%), millet (14%), pea meal, potato meal, barley (5%), poultry fat, sugar beet pulp meal (3.2%), minerals (incl. sodiumhexametaphosphate*), sea fish meal, poultry broth, brewer’s yeast, dried apple slices (0.5%), dried carrots (0.5%), dried green peas (0.4%), fructooligosaccharide (0.28%), dried spinach (0.2%), dried tomato (0.2%), sea fish oil (0.15%), linseeds, glucosamine (0.04%), chondoritin sulphate (0.004%).